Liverpool Music Week recently announced the complete and final line up for this year’s festival, which begins with the opening party headlined by Warpaint today at The Dome, Grand Central Hall in Liverpool. Now entering its 12th year, Liverpool Music Week is apparently the UK’s largest indoor winter music festival and has recently attracted over 48,000 people to the city each year, previously playing host to the likes of Godspeed You!, Black Emperor, Deerhunter, Gang of Four, Soak, Best Coast, Josh T Pearson, Health, Holly Herndon, Mogwai, Churches, Caribou, The War On Drugs, Wild Beasts, Forest Swords, Liars, Evian Christ and many more over the years. Sponsors and partners have included MTV, DIY, BBC Electric Proms, Liverpool Biennial, Sennheiser and Heineken. This year, the festival will be based around the hub of the Arts Club venue in Liverpool City Centre, long a hub for music under various guises over the years, with a run of shows at the centuries old Grade II listed Liverpool Dome and Grand Central Hall, as well as festival headliner John Carpenter playing in the surroundings of the Liverpool Olympia ballroom. 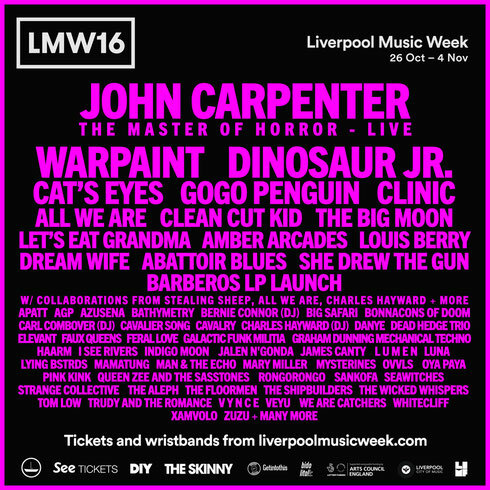 This year sees the launch of a limited number of LMW16 Wristbands that allow entry to all of this year’s shows (excluding the DIY Breaking Out series) for just £50, on sale now from www.liverpoolmusicweek.com.